Today’s transmissions are more complex than ever. When something goes wrong it can leave you worried about what to do, where to go and how much it’s going to set you back. With transmission repair services from Mr. 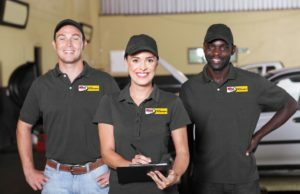 Transmission Milex Fayetteville GA, our experts offer the best, most affordable services to repair or replace the damaged or worn parts of your transmission and get you back on the road as quickly as possible. Your transmission system includes transmission fluid, electrical components, torque converters, and universal joints. To properly repair your transmission, each of these components needs to be dismantled, cleaned and inspected thoroughly. Through this process, Mr. Transmission Milex Fayetteville GA is able to accurately identify any performance issues before starting repairs. Once parts are inspected, repaired or replaced, they are reassembled, adjusted and tested to ensure proper operation. Transmission problems don’t always equate to the need to replace the entire transmission. Don’t end up saddled with an unnecessarily high repair bill. When you bring your vehicle to Mr. Transmission Milex Fayetteville GA, our experts will run extensive testing to pinpoint the exact nature of your transmission’s issue. You can trust us to get the job done right without draining your wallet. The cost of transmission repair will be based on the problem and what parts are required to fix it. Fortunately, 60% of all transmission repair jobs end up being minor. Mr. Transmission Milex Fayetteville GA is happy to offer our customers a free performance check so we can determine the correct course of action needed to fix any concerns. We use both new and remanufactured parts in our repairs, always bringing your transmission back to OEM manufacturer specifications. Some transmission repairs will include a reseal of your unit. If you’ve noticed your vehicle leaving spots on your driveway, it is likely there is a transmission fluid leak. Through a lift inspection, our experienced staff can locate the site of the leak and seal it up. Transmission repair services from Mr. Transmission Milex Fayetteville GA come backed with a 12-month/12,000 mile warranty. All Mr. Transmission Milex warranties are good at all our service centers nationwide. Mr. Transmission Fayetteville GA offers third-party financing with approved credit. Towing is also free with major transmission repairs in the Fayetteville area including Peachtree City, Newnan, Lovejoy, Jonesboro, and the South Metro Atlanta area. We service both automatic and manual transmissions, domestic and foreign models and all vehicles, including trucks, four-wheel drive, diesel, hybrid and recreational. When you find yourself in need of transmission repairs, put your vehicle in the capable hand of Mr. Transmission Milex Fayetteville. Give us a call for more information.